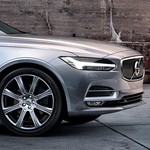 Drivers who appreciate stylish, popular, and capable vehicles will appreciate the many virtues of the 2019 Volvo V90 sport utility vehicle crossover. This crossover SUV is built for both comfort and durability while at the same time offering drivers a variety of specialized driving modes. The Volvo V90 is made to perform well on both city streets and off-road trails. To this end, this luxurious SUV offers drivers the convenience of five special driving modes that include Off-road, Eco, Individual, Dynamic, and Comfort. Drivers who seek a relaxing ride on well paved city streets can choose the Comfort mode with a push of a button. Drivers who are seeking the opposite can quickly conquer harsh off-road conditions with the Off-road mode in business. Plus, drivers who like to blaze their own trails can set several features manually with the help of the Individual mode.